This recipe is from my aunt. She only makes small batches using the big Horlick bottle. Cooked the rice in rice cooker. Cool down the rice. 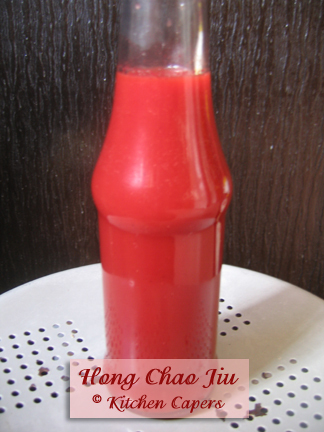 Put one layer of rice in the bottle, sprinkle with red yeast then chow paeng. Continue until finish. Tighten the lid and put in cool, dry place. Stir after one week. The red wine should be ready in about 1 1/2 month. Strain using cheese cloth. The wine is good for cooking. The residue will be Hong Chao. Add salt to the residue and keep in fridge. thanks for the recipe. Going to try that this weekend. do you need to soak the Glutinous rice first before cooking or just wash and cook immediately? tthksy, how much water to cook the rice? Sorry for this silly question. Just cook the rice immediately, no soaking. Use the same amount of water like cooking normal rice. Actually I never try the recipe myself but always watch the elders do. For Hock Chew people, the red wine is a must have during confinement and also for cooking mee suah. In Sitiawan, Perak where there are a lot of Hock Chew people, we can get fresh mee suah everyday. My mum have to dry them under the sun and ship them out to relatives. This really brings back all the memories. :cry: Haven't been back for soooo many years. thanks..will do that today. Just bought a pack of rice yesterday. actually I made some already..testing portion. well, it works. But realised my mistake only after reading your aunt's recipe..must blend the red glutinous rice. Which I didn't. the sieved out Red Wine.. I'm making a new batch today. Hopefully this time round, I will have a soft and mushy Red Rice residule like those sold in shops. I find this recipe very easy to follow..as compared to the White Glutinous Rice recipe..so many failures to yield the wine. oh..by the way, I found that the red rice I bought was labelled as Red Glutinous Rice. The shop owner told me its use for making this wine. No need to get the Red Yeast. I also found out that a mini cafe at Orchard Plaza, Singapore sells Claypot Hong Chao Chicken with Mee Suah. My boss knows the owner of this cafe. And I ask her to show me how she made this wine. She didn't tell me the full story but showed me this Red Glutinous Rice. She also says that she didn't use Red Yeast. what is chow paeng and where to get them? its also called Wine Yeast. Mostly chinese medicinal hall sells them. the one near my house sells 3 pcs for $1.20. The red wine should be clear. I think yours is very concentrate. If you need more explanation, I can check with my aunt. I know its supposed to be clear. I just filter out the rice and take photo..the concentration is the residule. After its settled, its clear red wine. My aunt used a cheese cloth to strain it. Tie and hang up to drip dry. DOnt drip too dry as we dont not want the hong chao to be too dry. Can someone tell me where can buy the ingredients and if possible, some photos for the ingredients? which ingredient? I think I have posted all the ingredients photos already. the wine yeast pic is at the Traditional Glutinous Rice Wine thread by LTan. She was the one who got me very excited about making this. This is the wine I made for my confinement use. I bought the wine yeast from Malaysia. They are divided into 2 types, sweet and 'lat'. That means we can control the amt of sweetness and 'lat'ness (alcohol content), depending on our taste preference. I bought the wine yeast in Singapore..at the Chinese Medicinal hall near my flat. Costs S$1.20 for 3 pieces. 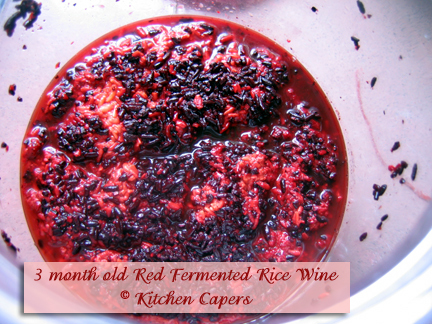 Recently the owner of the shop started to stock up for the Red Glutinous Rice for making this red wine. may I know what is red yeast in chinese and where can I get them? actually I don't even know the name for it. just tell the owner its to make Hong Chao wine. I bought them from a chinese medicinal hall/shop near my block at Hougang Ave 7. This shop is just next to the Evergreen Condo at Hougang Ave 7. If not, you can go to Kwong Cheong Thye at Geylang to get it. Gina, do you put the red rice under the sun? After sunning them, do you blend straight away? Can I sun it in the afternoon, thn keep until at night only do the wine? Btw, how much water do you use to cook the glutinous rice? I have just started my hong chao. Hope it turns out well. Gina, is this how it's suppose to look? Jo, how did yours go? Forgot to ask you earlier. I mean the other one that you were making. ohthe white rice wine ahh.. already all gonez... left a bit of residue in fridge. I used them to steam cod fish with yunnan ham and mushroom.. very good! ai ya sorry..didn't see this. so busy in the office. do you put the red rice under the sun? how much water do you use to cook the glutinous rice? as to your photo..the rice should be mixed with yeast. not one big patch of white and one big patch of red. Leave it aside. after 1 week, give it a good stir. However, watch it after 3 days. you should see bubbles forming at the bottom of the pot. If you see white -- greyish moulds on top of the rice..means you must THROW away..your rice wine making has failed. Thanks Gina. I will look at the hong chao tonight when I get home. Do you mix the red yeast & the glutinous rice first before putting into the jar? From the recipe, it says put 1 layer of rice, then yeast, etc. Do you smoothen the rice to make it an even layer? Gina, the one used to make Wine chicken is rice wine, right? Jo, glad to hear yours turn out well. 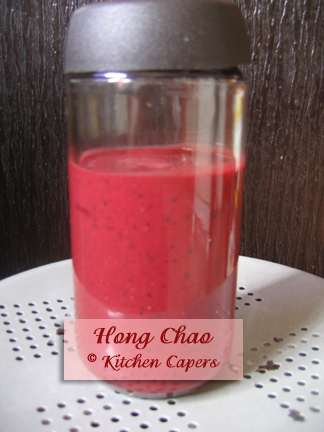 I will try that after making this hong chao.